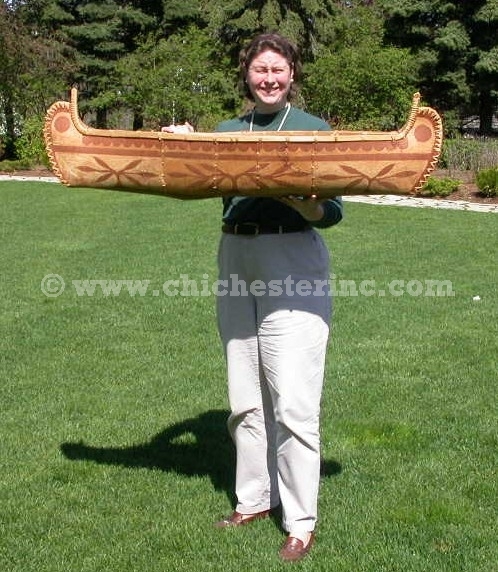 The canoes are made in the traditional style using birch bark and spruce roots. The men usually make the canoes and the women etch designs on the outside. These canoes are becoming more difficult to obtain with each passing year. The canoes are not signed, but most likely are made by members of the Dube family. The 12' to 14' full size canoes are available for around US$10,000 each. The designs are similar, just much larger. Our Gxx codes denote individual pieces. 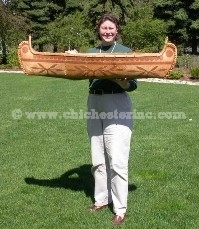 If you would like to order a specific canoe, please go to our Gallery to pick the exact one shown. Genus and species of birchbark: Betula papyrifera. Wild.